Just like there are different image and audio formats depending on which use they are going to receive or the device on which they are going to be played, there are also different kinds of videos for different players. One of the devices on which plenty of videos are viewed nowadays are mobile phones, because they have a decent screen to watch a film. 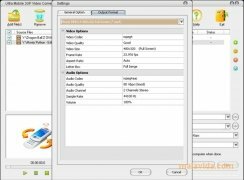 Ultra Mobile 3GP Video Converter allows us to convert from DivX, XviD, AVI, WMV, MPG, MPEG, MP4, M4V, FLV, 3GP, ASF, RM, RMVB, MOV, ASX, MKV, OGM, SVCD and VCD to any format compatible with a mobile phone, being only necessary to select our terminal's model from a list, configure the preferences and press on the button that launches the action, and the application will take care of the rest. The application also allows us to crop a fragment of the video to extract the part that we are interested in, or standardize the audio in case the one included in the video doesn't sound high enough. Transfer your movie collection to your mobile in a very easy and quick manner with Ultra Mobile 3GP Video Converter. Only converts the first five minutes of each video.